“I think if I had told my dad, ‘Seven months after you’re dead you’re going to be dominating the news and all over Twitter,’ he would think it was so hilarious that our president was so jealous of him that he was dominating the news cycle in death,” Meghan McCain said on ABC’s “The View,” the daytime talk show she co-hosts. “This is just so bizarre because it’s about my dad and it’s a hot topic,” she said. Trump, who has blamed McCain for killing an Obamacare repeal bill in a Senate vote in 2017, took up the feud again over the weekend, falsely accusing the senator of disseminating a copy of the “Steele dossier” on Trump’s ties with Russia before the 2016 election. 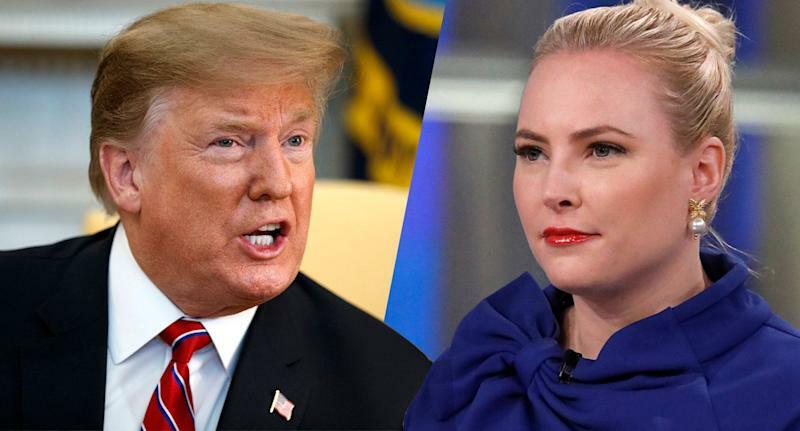 Meghan McCain blasted the president over his comments on Monday’s show. During an Oval Office appearance Tuesday with Brazilian President Jair Bolsonaro, Trump brought up McCain’s famous “thumbs-down” vote against the Obamacare repeal bill Trump had endorsed. Trump’s comments this week drew a rebuke from Republican Sen. Mitt Romney and a polite pushback from Sen. Lindsey Graham, R-S.C., McCain’s longtime friend. “I want to make sure all of you could see how kind and loving a stranger can be,” Cindy McCain tweeted. Meghan McCain, though, told “The View” viewers not to fret.